My friends will all tell you that there’s one thing that’s absolutely predictable about me: I’m a sucker for romance. Anything that lets me know my boyfriend has been thinking about me fills me with wonderful happiness. I’m rather easy to please as well. It doesn’t always have to be the most expensive red roses or a box of expensive chocolate (although those are good too). Sometimes I’m happiest with the simplest of things. Yes, that’s right. A stone. Or to be more precise, a pebble. My (then) boyfriend was walking along one day and he saw this gorgeous three-toned pebble that he picked up. Later he washed it, packed it in cotton wool, and put it in a small box. I adored it then and I still adore it now. I love pretty pebbles (I used to have a comprehensive collection and I still pick up pebbles on walks) and I love the fact that he thought of me while he was out and about. 2) A note asking me what I wanted for dinner. He intended to buy us a take-out meal that night and we didn’t get a chance to talk to each other in the mornings (he used to leave the house at 5.30 am, long before I woke up) and he left me a note that said: ‘Good morning, sleepy face. What do you feel like for dinner tonight?’ It made me grin. 3) A Sims 2 expansion I really wanted. My (then) boyfriend knew I wanted a Sims 2 expansion really badly. The game wasn’t available in stores here yet, so he ordered one for me especially. I was so happy that I told him I ‘+++’d him – a reference to the ‘+’ signs the Sims denote when they show approval of something. The more plus symbols there are – the more fierce the approval! The list actually is endless; I’ve been blessed with some thoughtful boyfriends in the past, including one who bought me a gift in Kazakhstan when he travelled there, and then mailed it to me from the US. It was a hat that made us both laugh hysterically; in fact, I still have it somewhere. It had the most enormous fake plaits sprouting out of it at the sides; when I wore it I would pretend I was a Valkyrie and swoop around on my invisible chariot! Anyway, as nostalgic and sweetly reminiscent as this post has been, it’s mostly about this picture that my friend sent me of what she deemed to be the ‘most romantic proposal’ she had ever seen. I thought it was a gorgeous photograph, but of the act itself I had – and still have – reservations. 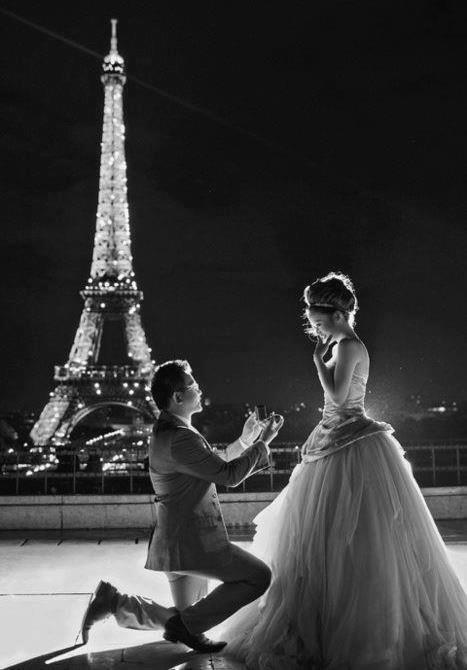 You see, although I’ve been proposed to in this fashion in the past, man before me on bended knee, I don’t understand it. Why should my husband-to-be go down on one knee before me? Is he begging me to marry him? Or is it the significance of something that I don’t quite understand? I think that being married is about being equal – so if I won’t go down on one knee before him to ask him to marry me (and I won’t) – why should he?